GMan Custom High Flow Motorcycle Fuel Filter for Suzuki VL1500 Motorcycle. The Last Fuel Filter you will ever need to buy. Replace that expensive, disposable plastic Suzuki fuel filter with its flimsy hoses and restrictive fuel line bends with GMan's cleanable, high-flow fuel filter kit! Our GFilter Kit includes a Cleanable / High Flow Fuel Filter encased in an aluminum housing, with a cleanable brass/bronze filter, plus marine grade reinforced fuel lines, stainless steel hose clamps and all instructions for a complete install. With the additional security of being cleanable, this kit is highly recommended to anyone who doesn't want to be stranded with a plugged fuel filter. The GFilter Kit will also eliminate the lean condition that occurs on Stage 3 setups at the higher RPM ranges usually only detectable on a dyno with a sniffer, but is real. Cleaning simply involves unscrewing both halves of the filter, wiping the internal element clean, maybe spray with WD40 and reattach both halves....it's that simple! The GFilter is for the 98-04 Suzuki VL 1500 LC ONLY and WILL NOT fit the Suzuki C90 Boulevard. The GFilter is covered under GMan's 2-year Warranty. Click here for details on the 2-year Warranty and enjoy with confidence! Review: I have purchased many products from you and always leave reviews because your products are so good, put it this way my motorcycle has been much more enjoyable to ride this last year since installing several of your products only thing now that I think I may need to add is an extra gas tank for my 2003 Suzuki Intruder 1500 LC. As far as the rest of my motorcycle it preforms better than it ever has thank you so much. You are definitely specialists in what you do. Review: I love this fuel filter. buy once, and just clean to maintain it. High quality, high flow, good price. The new routing is also much more efficient. 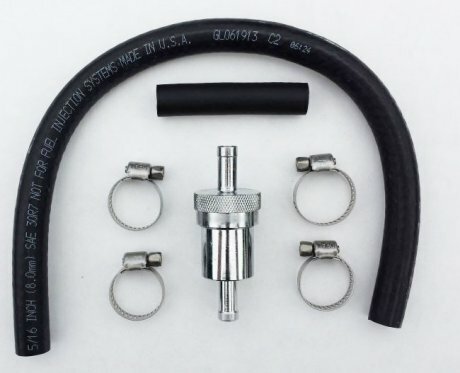 The fuel hoses and stainless hose clamps are high quality, as one would expect from GMan. "Awesome-more power and better gas mileage"
Review: I bought the stage 3 kit from G-Man and within a few day I had it. I installed the jet kit with the instructions and it was a breeze. I recommend the stage 3. G-man your the best.